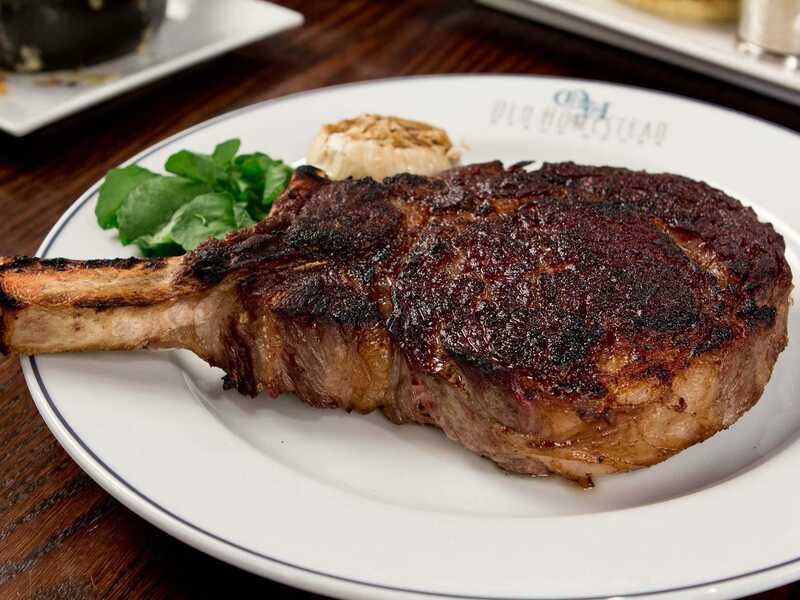 Daniel Goodman/Business InsiderRib steak at New York City steakhouse Old Homestead. Sure, you love steak and know all the best steakhouses, but are you a true connoisseur? 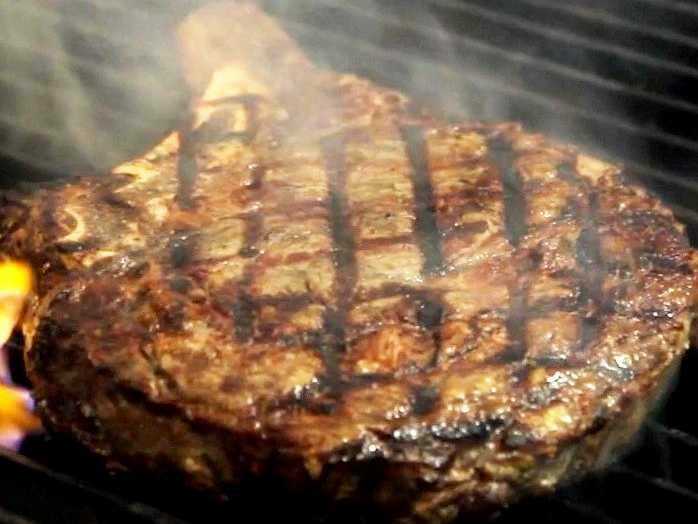 We spoke with New York City’s Old Homestead Steakhouse team (including owners Greg and Marc Sherry, and Executive Chef Oscar Martinez and his culinary team), as well as Executive Chef David Nichols at the Gerber Group and Executive Chef Paul Neidermann at BLT Prime Doral in Miami on the steak knowledge that separates the men from the boys. Keep reading to see their answers. A Porterhouse steak and a T-bone steak are not the same. 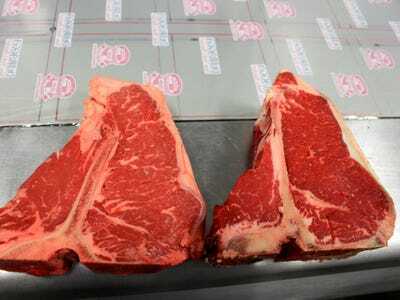 Though they look almost identical, are both part sirloin and filet mignon, and are both double-cut, you get more bone and less meat with a T-bone. Filet mignon doesn’t have to be aged. Because it’s so lean, there’s no fat to break down, making the process unnecessary. The rump is underrated and supremely flavorful. Just because the rump is a tougher kind of meat doesn’t mean you shouldn’t order it. It’s more flavorful than filet mignon and one-third the price. Don’t be afraid of over-seasoning, especially if you’re grilling. Paul Neidermann, the executive chef of BLT Prime Doral in Miami, says most of the heavy seasoning will fall off onto the fire anyways. Better to have more flavour than less flavour. Business InsiderSalt and season your steak 45 minutes before grilling. Make sure your heat source is hot enough. Give your grill or pan plenty of time to preheat and test the heat before putting your meat on. If it’s hot enough, you shouldn’t be able to hold your hand over the grates for more than 2 seconds. On the subject of heat, thicker steaks require lower heat than thinner steaks. This one makes sense when you think about it: Cooking a thicker steak on high heat will cause the exterior to burn before the inside has cooked enough. Grilling your steak will give you the best results. According to Executive Chef David Nichols at the hospitality and nightlife company Gerber Group, grilling retains the best flavours in the meat since it’s a slower process and the coals allow the meat to heat evenly. Business InsiderUse tongs to turn your meat — never a fork. And if you are grilling your steak, don’t touch it if it’s sticking to the grill — that means it’s not ready to be turned yet. Be patient and touch your steak as little as possible to keep all the juices inside. Use tongs to handle steak. Never use a fork, which pierces the steak and causes the meat to lose juice and flavour. The less you touch and poke the steak, the better it will be. Sear both sides of steak on high heat first before cooking. Place your steak directly over a flame for two minutes on each side, and then cook the steak off the flame until it’s done. This will seal in the moisture and make steaks extra juicy. Let your steak rest for half the amount of time you cooked it. This will let the juices retract and stay inside the meat, not on the plate. Business Insider/Liz O’ConnorWell-aged steak (left) and dry-aged steak (right). Dry ageing steak causes it to lose moisture. Only a few New York steakhouses still have prime rib on the menu. Most have removed the menu item because it’s too expensive to feature and what isn’t sold at the end of the night has to be tossed. 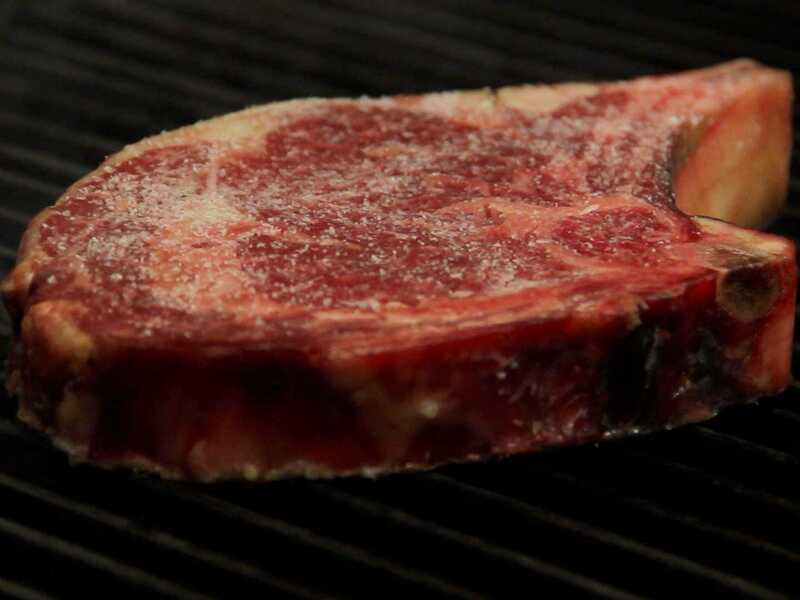 Dry-aged steaks are more expensive because of mould and moisture loss. When meat is dry-aged, it’s stored in temperature- and humidity-controlled refrigeration from three to six weeks as the moisture evaporates and the fibrous connective tissue that holds the cow’s muscle together breaks down, giving it a softer texture. A thin layer of mould often develops as well, and that is trimmed before cooking. Couple that with the moisture loss (about 20%), and the beef will weigh less than when it was first bought. Restaurants pay for the beef pre-weight loss though, which means as a customer you’re also going to pay more for your dry-aged steak. The cost of beef rises when there’s a drought. No water means less grass growing, which forces farmers to purchase more expensive grain-based feed, like hay or corn. Memorial Day — not the 4th of July or Labour Day — is the biggest day for beef. The other two holidays tied for second, according to Old Homestead Steakhouse. Daniel Goodman/Business InsiderOrder creamed spinach with your steak. 28% of people who order a steak get a baked potato. 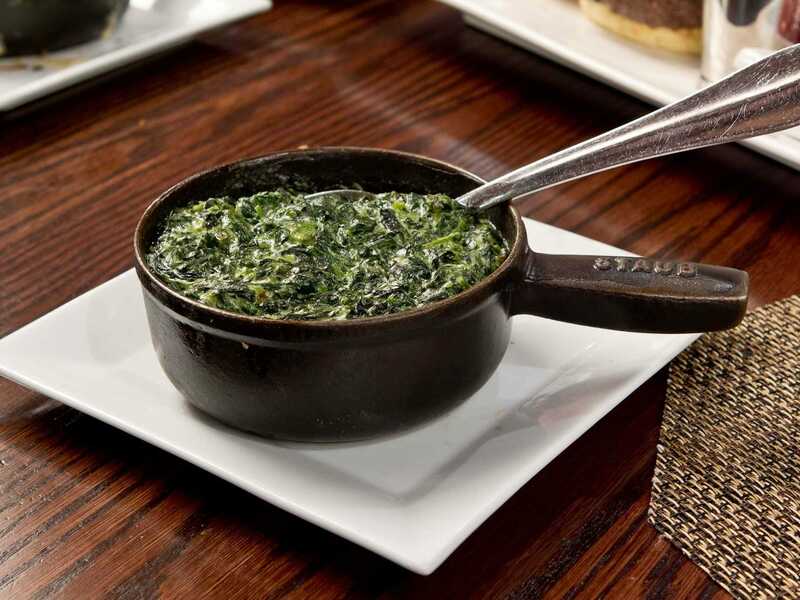 But really you should try a more classic side, such as creamed spinach or a hashed brown potato cake. Love steak, but not sure what to order? Follow this guide from Old Homestead Steakhouse: If you want melt-in-your-mouth tender, order filet mignon; tender but slightly chewy, order a sirloin; extremely juicy and flavorful, order a rib eye; can’t make up your mind, order the porterhouse (which is part sirloin, part filet mignon). Now go eat some steak.